It seems impossible but in as little as four months you could be shopping for some SUP Accessories before you make that first journey of the year out to your favorite lakes and rivers. 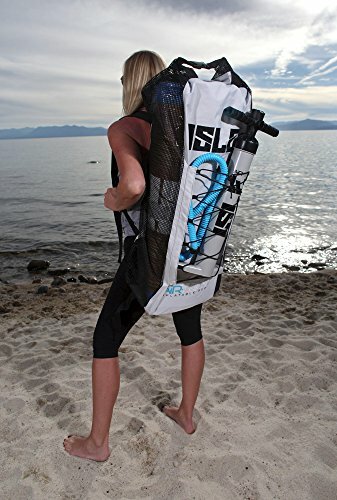 If you are a dedicated paddleboard user, there are plenty of new items you could add to your paddleboard gear that will increase the pleasure you have while out on the water. It doesn’t take long to become an accomplished paddleboarder, and it is a sport that the entire family can enjoy together. Paddleboards are made in all lengths and thickness, so they can accommodate people of all ages, sizes and levels of expertise. Since we are talking about the inflatable paddleboard, let’s look at the most important accessory needed to inflate the product. Most paddleboards will come with a manual air pump, that is similar to one used to blow up a bicycle tire. They are not that hard to operate but it can take up to 10 minutes or so to inflate the iSUP and it does take some hard work. Maybe you enjoy this part of paddleboarding, good for you! If inflating your paddleboard is a real pain in the neck for you, you might want to think about getting an electric or battery-operated pump. They come in many different shapes, sizes and prices and will decrease the time you spent on the inflation process. The electric air pump is a must for those that have some limited physical abilities that will not let them use a manual one but can still enjoy the sport of gliding across the water on a paddleboat. There are pumps on the market that can plug into the cigarette lighter in your car and will also have an attachment that you will be able to connect directly to the battery of a vehicle as you would when charging a car battery. Others come with regular batteries and some with rechargeable batteries. If you are not able to blow your board up near a vehicle, a pump that operates with batteries, would be a great choice for you. If you are near a large air compressor, there is an attachment valve that is specific for iSUP’s that will allow you to use the big air compressor for inflation and it takes very little time. Always get a SUP pump that has a gauge on it or a gauge that can be attached so you never over inflate your paddleboard. This is one area where you always want to follow the manufacturer instruction to prevent damage to your SUP. Below, I have listed some brands of pumps that are popular and well rated for you to look at, if you are in the market for an upgrade or just want to switch from your manual pump. If you are interested in purchasing a new paddle, there are certain features that you need to think about. The most important factor is its ability to float and most of them do. Next, check the weight of the paddle. Around two pounds and under is an acceptable weight even for children. You will find that most paddles come in two or three sections and are easy to snap together. The ideal paddle will be made with an aluminum or carbon fiber shaft and will extend from 66” to 83” in length. The blade can be a durable nylon composite or a rugged polycarbonate material. It is a great idea to have a carry bag that is specifically designed to carry the paddle to protect its surface and structure from any damage. Why pay a lot of money for a paddle and then just throw it in the back of a truck or car. The handle part of your paddle means a lot when we are talking about being a comfortable fit. Some handles are ergonomically designed for hours of paddling. Try the paddle out for fit and comfortable feel before buying. Maybe a friend has one that has caught your eye, see if they will let you try it out. Oh! And ladies, you can even buy a pink paddle to go with your pink paddleboard. I’ve listed below, some paddles that you might want to look at as a future investment. Almost all inflatable paddleboards will come with a carry or storage bag made of nylon, or other lightweight materials. Many are styled like a backpack with padded shoulder and chest straps that you slip your arms through to carry. They can fit people with a 30 inch chest up to a person with a 46 inch chest. Some of the carry bags are lined with mesh to allow your board to dry after packing it and also have a roll strap to hold the board tight and keep the weighted distributed evenly at all times. There are usually a combination of straps on the outside of the bag so you can grab it and go in different situations. You may find as many as six different style of straps, inside and outside pockets for carrying all of your paddleboard gear in one bag. Some of the newer styles come with wheels attached or you can buy a constructed cart with wheels that will allow for easy transport over land or even in an airport if you are taking your SUP with you on a great new adventure. Don’t use a bag with mesh sides if you are going to transport your SUP by airplane, there is just to much chance of it snagging on other luggage. Closure style can be drawstring, velcro, snapped or zippered. If you plan on storing your paddleboard in the carry bag until your next use, try to keep it out of direct sunlight. Many of the bags and some boards do not offer UV protection so store in the shade or in your garage. If you live in a cold winter state, it will not hurt the SUP or paddleboard gear to be stored outside in a storage unit or garage. Just put it somewhere and leave it alone. Don’t keep moving it around to make space for other things. I store mine in the back of my closet in the bedroom. It is out of the way and I don’t disturb it until late spring-early summer. I have listed five different carry bags that are well constructed and priced right. We all have different likes and needs and a carry bag style is no different than the paddleboard style we like. Protecting your SUP when not in use is important and you can do just that with the right carry bag. One of the most important factors we need to think about in any sport we participate in is SAFETY! If you are going to paddleboard in a different state than where you live, catch up on any rules and regulations that might apply to you. If you are a beginner read my article on Paddle-boarding 101 Safety here. Some states are starting to require the use of a life vest for most water sports and I can’t help but think that it is a great idea. Life vest and belts made with today’s technology are smaller, more comfortable and won’t inhibit your movements. Most of the time you won’t even know you have it on. If you are on the water with your children, you are not going to be able to keep a eye on them every minute. A safety vest would be a must have for the young paddleboarders. The new style vests are designed in such a way that you will have complete movement and rotation of the arms. Some vest will already be inflated and some come with a quick pull cord that will inflate them in seconds. For children, the already inflated ones will give you, as a parent, more peace of mind. For the adults, the inflatable belts are a great idea. The belts come with compressed CO2 gas that is released when you pull the jerk cord and it fills an internal bladder that will give you between 17-22 pound of buoyancy. Some also have an added oral inflation tube to ensure sufficient inflation power. This is not recommended for children because it takes some strength to pull the inflation cord and could be a bit confusing for a child in distress. Some of the vests and belts will have small storage pockets to keep valuables in like your car keys or required medication that must be with you at all times. I have searched for, and come up with 5 safety vests or belts for your consideration. Make no mistake, either one of these products is a great investment and they are US Coast Guard approved. Just imagine your expensive inflatable paddleboard floating away from you because you thought the ankle leash was a hoax! When packing your paddleboard gear, please, please don’t forget your leash. Most people will use the ankle leash but you can also use it on your calf or knee, just so it is comfortable for you, The pad that fastens to your body part is around 2 inches wide and will fasten with a buckle or velcro strips. Its main purpose is to prevent your board from getting away from you and floating down the river without you. Most leashes have a coiled cord made of heavy duty material that will stretch to 5X its coiled length. In the event that you fall off or have an accidental spill, your paddleboard will be within your reach. To keep the leash out of your way and tangle free, the coil is connected to the ankle strap with a double swivel feature. Most leashes, when stretched out are around 10 feet. I have listed below, leashes for ankle, calf and knee uses. Take a look at the one you would like to try if you are not happy with the one you have now or you just need a new one. They are well worth investing some money in. There are many other paddleboard accessories on the market but I would consider them luxuries and not have to haves. I would like to list a few for you to think about that could increase your enjoyment and well, just have more fun with your paddleboard. Hope I have helped you get in the “paddleboarding Mood” by looking at some great products that will increase your enjoyment of the sport. There are some great quality products out there to look at if you are needing to replace some accessories plus some new and innovative products. Always think about what it takes to be safe and still have a fun time with whatever SUP Accessories you purchase.